Before the regular session scheduled for last night, Trenton’s City Council held what was essentially a hearing on the status of the Trenton Water Works (TWW), an initiative suggested by At-Large Council Member Duncan Harrison. It was decently-attended by residents of Trenton (including many mayoral and council wannabes) and several from the surrounding Townships served by TWW. Dude, you think? That should be one of the most basic trivia facts you should have researched before making a presentation to Council. Mr. Cherry was, throughout the evening, unable to answer most questions from Council without either deferring to others on his team, or telling Council that he would have to check on their questions and get back to them. His lack of a grasp on what should have been fundamental operational and process questions was matched by Filtration Plant Superintendent William Mitchell, who fumbled his way through an unsteady response to the question of how many people worked in his plant. The evening was not made any easier by Councilmember Harrison. He had a list of 12 questions, which he proceeded to ask Mr. Cherry, and it was obvious this was the first time he was hearing those questions. It would have been more helpful (ok, only marginally more helpful given Mr. Cherry’s grasp of the basic facts of his operation), as well as standard operational procedure to have provided those questions to the Director in advance of the meeting, to allow a well-researched and prepared response. But, what’s SOP elsewhere is once again unknown in Trenton. The presentation did not offer – and not a single person on Council asked for – financial statements. Without a Balance Sheet, it’s impossible to see how that $100 Million of debt fits in the overall financial condition of TWW. How much other debt is TWW carrying? What are the utility’s assets looking like these days? Does it have enough cash to handle its obligations? Or, because the back-office business operation is just as screwed up as its production operation, are we owed millions of dollars of unpaid customer payments? And without an Income Statement, there’s no way to know the overall income and expenses of the place in a given year. For a large business operation like the Water Works, serving much of Mercer County outside City Limits, it is unacceptable to me that basic financial information was not offered by the Administration nor sought by Council. But there could be a good, deliberate reason for that. I will show you two slides from last night’s presentation. This slide provides some historical context for TWW’s operations. 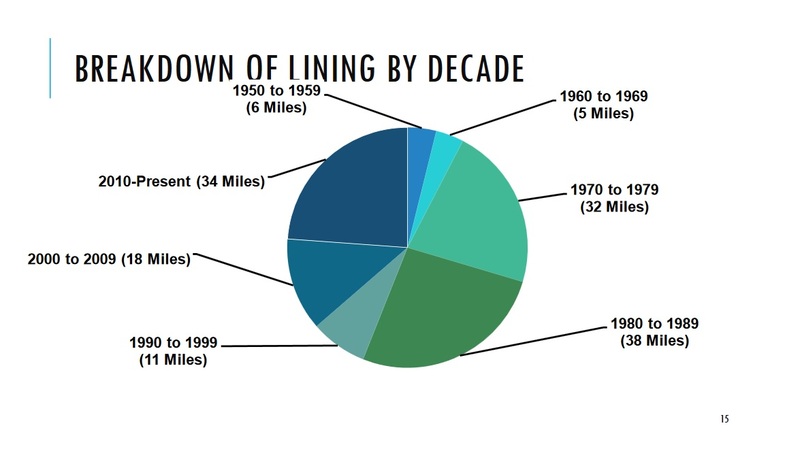 It shows how much pipe maintenance, expressed as pipe “lining,” has been performed by the utility over the last 60 years, expressed in decades. I think this is a good stand-in thumbnail summary of TWW’s overall maintenance activity during those decades (Heck, these two slides were the only historical info provided last night!). When much of the pipes were relatively new, in the 1950’s and ’60’s, maintenance was relatively scant. By the 1970’s, lining work was performed on 32 miles of the system’s pipes. In the ’80’s, a somewhat larger amount, 38 miles, was done. By the 1990’s and 2000’s, this work dropped dramatically, to only 11 miles and 18 miles, respectively. 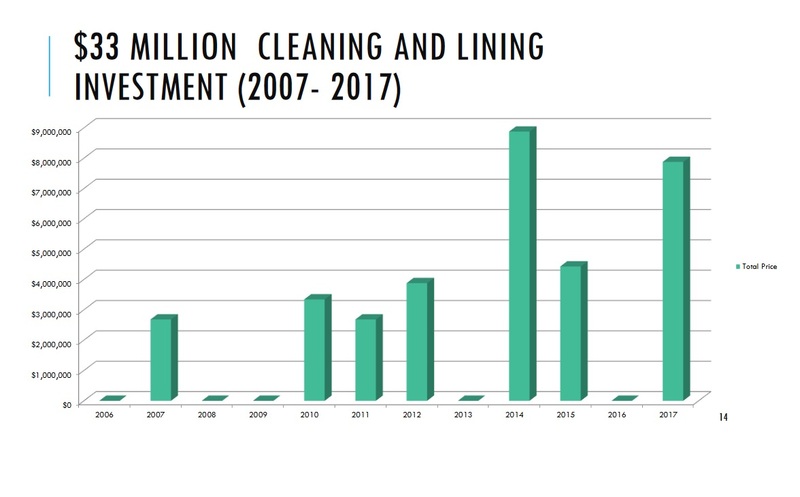 In the graphic below, you can see that no money at all was spent on this kind of work in 2006, 2008, and 2009. The 1990’s and 2000’s were the years of Douglas Palmer’s mayoral term. As the charts above clearly show, these decades were when TWW was first starved, a practice that continues to this day. Starved of basic capital maintenance and starved of manpower. Starved of competitive salaries that would attract the kind of highly-skilled professionals critically needed to run a safe operation. Expenses – even on necessary items – were cut to the bone in order to improve the net profitability of the Water Works, so that utility profits could be used to subsidize the City of Trenton. Whether directly using TWW’s surplus to pad the City’s bottom line, or paying City Hall employees on the Water Works payroll, the water utility has been a cash cow for the City of Trenton. These financial benefits, let’s be clear, which accrue only to the City of Trenton, are paid for by customers throughout Mercer County. This is important enough to repeat, with emphasis. These financial benefits, artificially boosted by starving TWW of decades of resources, accrue only to the City of Trenton, are paid for by customers throughout Mercer County. These practices have gone on for nearly three decades. The worst of these practices were begun during the Administration of Douglas Palmer, aided and abetted for much of his term by his Director of Public Works. Who is now the outgoing mayor. Also aided and abetted by this Council, who have known for years about both the long-standing problems at the Water Works, and the practice of putting personnel who had nothing to do with TWW, working elsewhere in the City, on the Water Works payroll. The outgoing mayor, by the way, was conspicuous by his absence last night. His Department Heads were there to provide information, as poorly as they did, and answer questions. I suppose the Buck Stops Well Short of the Mayor’s Office these days. The current crisis of competence at TWW is the inevitable result of decades of deliberate neglect by successive Administrations and Councils. We are now seeing what happens when you squeeze a cash cow for far too long. Trenton voters have to take some of the blame for this situation, too. In 2014, voters had plenty of information about the former Public Works Director, and his responsibility for the environment of ongoing corruption and mis-management at TWW when he was in charge, but they voted him Mayor anyway. That he continued his old ways should have been predicted. Well, as a matter of fact, it was, well before the 2014 election. For me, if Eric Jackson cannot show that he at some point in his tenure brought in law enforcement to investigate the situation at TWW, that will sink his candidacy. He cannot be seriously considered as a potential Mayor if he allowed a culture of corruption to survive unchecked at the utility without trying to call in the cops. Beyond the candidacy of one man, though, the integrity of the Trenton Water Works is vital to Trenton’s residents. Right now, TWW smells like a sewer. The past four years has been enough for many critics and angry water customers outside of Trenton to argue that the Works should be taken out of city hands and regionalized at the County level, at least. Every new revelation of past corruption, and waste, and theft that precedes the Mack years hurts the City’s case for its future stewardship of much of Mercer County’s water supply for its residents. And were we in May’s elections to select individuals from that past to lead Trenton past 2014 might prove to be the final nail in the coffin of the Water Works as Trenton’s. The final nail has not yet been hammered in. But there are some in the box already. As I wrote above, what’s happening now is the inevitable result of decades of neglect. We saw it coming, and still allowed it to happen. Shame on us.